Lovely tray from a dressing table set. Backstamp: Rd No 623294 This Pattern was introduced by William Adams in 1780 being a copy of a Chinese pattern & one of the first of its style produced in English pottery Wm Adams. Light all over crazing and on the back a little wear and some blue smudging. Overall excellent condition. This is a lovely little pot with cover, probably from the dressing table set. Backstamp: Made in England Rd No. 623294 This Pattern was introduced by William Adams in 1780 being a copy of a Chinese pattern & one of the first of its style produced in English Pottery. Wm Adams. Inside the lid there is a gold seal "Margaret Rose Series L Carr Crumpsall", the significance of which we are not sure! There is a little minor wear to the rim of the cover and it has just a very slightly crisper print than the base, otherwise excellent condition. This is a lovely little pot with cover, probably from a dressing table set. Backstamp: Made in England. Reg. No. 623294 This pattern was introduced by William Adams in 1780 being a copy of a Chinese pattern and one of the first of its style produced in English pottery. Wm Adams. Excellent condition. With gilt. Four small pieces from a dressing table set decorated in a lovely floral pattern highlighted with gilt. No backstamp. The gilt is very worn and there are some minor blemishes here and there. Around the foot of one of the little pots there is a little wear and some manufacturing faults which have been glazed. With gilt. Gorgeous tray from a dressing table set, but a totally multi purpose piece or beautiful for display. Backstamp: Christmas Roses Adams & Co Semi Porcelain England. The gilt is very worn and there is some surface scratching and just a little discolouration, overall excellent condition. Lovely tray with moulded wavy rim. Backstamp: Venetia Barker Bros Ltd Meir Works Longton. Light all over crazing with a little minor wear on the back otherwise excellent condition with barely a scratch to the surface. With gilt. A gorgeous set of a tray, pair of candlesticks, ring tidy, pin tray and hair tidy/pot. Backstamp: Khan Bisto England and in script 1835. The gilt is quite worn on all pieces and non existent on the pin tray and ring tidy. There is a little minor discolouration inside the pot which would originally have had a pierced cover for a hair tidy or solid cover. The ring tidy has some damage to the tip exposing raw clay. Overall an absolutely delightful set. With gilt. An absolutely gorgeous little dish. Backstamp: Booths Silicon China England Mosaic Panel. Some surface scratching and a little wear to the gilt. With Gilt, A8025. Very pretty little pin tray. A little wear to the gilt and small rub to one corner otherwise excellent condition. With gilt. This is a delightful little pot standing on four small feet and with two little side handles. The finial on the cover is a gorgeous little delicate flower. Both pieces are crazed and the cover has a small area of restoration to the underside rim and the pot also has small discreet restoration to the rim. Backstamp: Brown printed Booths Silicon China England. A rarity from another era! With gilt. Backstamp: Burleigh Ware Burslem England B & L. Crazed with some discolouration to the base and wear to the gilt. Lovely round box with cover. Backstamp: B & L Burleigh Ware Burslem England. Excellent condition. Delightful round covered puff box. Backstamp: Scilla by Lillian Delevoryas Burleigh Staffordshire England. Excellent condition. With gilt. A pretty round box with lid. Backstamp: Burleigh Ware Burgess and Leigh Burslem England. Light all over crazing and the gilt is very worn, it does however remain a very attractive piece. With gilt. Fabulous set of a pair of candlesticks and three covered boxes on a rectangular tray. Backstamp: Burleigh Ware Burgess and Leigh Burslem England. All pieces have light all over crazing and there is some wear to the gilt, overall excellent condition. Small hexagonal pin tray from the dressing table set. Pattern on the inside only. Small rim chip otherwise fine. 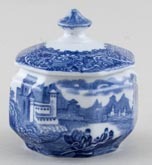 From the dressing table set, a delightful little pot with border pattern around the cover and main pattern around the pot. Backstamp: Blue printed Cauldon Ltd England Brown Westhead Moore & Co Est 1774 Blue Moore A little minor excess clay to the inside rim of the cover otherwise excellent condition. From the dressing table set. Border pattern around the cover and main pattern around the pot. Excellent condition. Delicate little ring tidy. Backstamp: Cauldon Ware. Excellent condition. Attractive octagonal hat pin holder. It has a tiny hairline to the inner rim otherwise in excellent condition. Blue printed backstampCauldon Ware. A lovely set and so rare to find all of the pieces together. Octagonal tray with two small octagonal pots with covers, one larger octagonal pot with cover, one small octagonal pin tray and an octagonal ring tree. One small pot has a small rim chip to the cover, a little light crazing and a small firing fault to the rim. The other small pot cover has a little light crazing. With gilt. Rectangular trinket tray in superb condition. A gorgeous little piece from a dressing table set with continuous scene around the body of the pot and a windmill to the cover. Backstamp: Doulton Burslem England Norfolk Rd No 251612. Cover has light crazing and a little minor wear underneath, overall excellent condition. A gorgeous little piece from a dressing table set with continuous scene around the body of the pot and a windmill to the cover. Backstamp: Doulton Burslem England Norfolk Rd No 251612. The cover has light crazing otherwise excellent condition. Octagonal tray with fine all over crazing and some areas of staining. The latter mainly on the flowers in the urn to the right of the scene. Very pretty floral border. Octagonal column standing on four small feet. The top is pierced to hold hatpins. Light crazing otherwise absolutely fine. With gilt. This is the small pot from the dressing table set. The rim border design is Alhambra pattern. Light crazing and some wear to the gilt. With gilt. A small pot with a central hole in the cover. The rim border design is Alhambra pattern. There is a little wear to the gilt and a little crazing otherwise excellent. With gilt. A lovely ring tidy with a rural scene printed in a lovely soft sky blue with a slightly darker blue to the border decoration. The rim border design is Alhambra pattern. Black printed backstamp: Grimwades Stoke on Trent England. Excellent condition. Very pretty little piece with vignettes of pattern around the rim. No backstamp. Light all over crazing with just a little minor mottling otherwise excellent condition. Very pretty piece printed in a steely flow blue. Probably once with gilt but only traces remain! Minor signs of wear around a couple of the holes otherwise good condition. No makers marks but definitely Sampson Hancock. Bone china with gilt. An extremely pretty little box, with base and cover beautifully patterned. Backstamp: Willow Hillchurch Pottery Hand Engraved Pattern Staffordshire England. Excellent condition. A most unusual pot, from this German maker. Pretty floral pattern with NIVEA Creme in white lettering on the top. Excellent condition. Delightful small oval trinket box which would originally have had a lid. Backstamp: Abbey England. Excellent condition. This is the octagonal tray with embossed rim from the dressing table set. It has light all over crazing but otherwise excellent condition with barely a scratch to the surface. Not marked but definitely by George Jones. Delightful octagonal tray with moulded or embossed rim. This item is not in the catalogue, but see Figure 211, Page 92 of George Jones Ceramics by Robert Cluett for a similar tray. 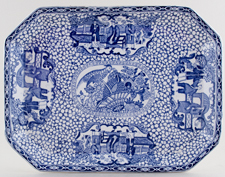 This tray is in superb condition, with just a few lines of crazing to the glaze on the back. There is no backstamp, but definitely George Jones. Gorgeous small round pot with lid from a dressing table set. Backstamp: Losol Ware Cavendish Keeling & Co Ltd Burslem England Regd No 595146. There is a little discolouration inside and on the top of the lid a small manufacturing blemish which has discoloured. Fabulous little piece from a dressing table set. Backstamp: Regd No 595146. Underneath there are one or two minor blemishes otherwise excellent condition. Delightful little pin tray from a dressing table set. Backstamp: Losol Ware Jacobean Keeling & Co Ltd Burslem Made in England. A little very minor surface scratching, overall excellent condition. Gorgeous little box and cover from a dressing table set. Backstamp: Losol Ware Jacobean Keeling & Co Ltd Burslem Made in England. A little very minor wear under the lid otherwise excellent condition. Lovely holder in this very pretty floral pattern. The top is pierced with five holes. Backstamp: Blue printed 14. Excellent condition. Fabulous little ring tidy from a dressing table set. No backstamp. Excellent condition. Gorgeous little box with lid from a dressing table set. Backstamp: Losol Ware Jacobean Keeling & Co Ltd Burslem Made in England. The occasional tiny blemish otherwise excellent condition. Part set of pin tray, ring tidy and covered box. Backstamp on pin tray and box: Losol Ware Jacobean Keeling & Co Ltd Burslem Made in England. A little minor wear to the rim of the tray, underneath the ring tidy and underneath the lid of the box. All very minor, overall these are in excellent condition. With gilt. Backstamp: Losol Ware Lothian Keeling & Co Ltd Burslem England. Excellent condition. With gilt. Pretty little box with cover. Backstamp: Losol Ware Lothian Keeling & Co Ltd Burslem England. Light all over crazing with a little minor wear to the gilt and a tiny tiny nick to the inside rim of the cover. With gilt. No backstamp. Light all over crazing otherwise excellent condition. With gilt. Delightful little box with cover. Backstamp: Losol Ware Lothian Keeling & Co Ltd Burslem England. Light crazing with just a little very minor wear to the gilt and on the cover there is a tiny manufacturing blemish. Overall a gorgeous little piece. With gilt. Pretty little piece, the cover has a central hole. Backstamp: Losol Ware Lothian Keeling & Co Ltd Burslem England. One or two lines of crazing and a little wear to the gilt otherwise excellent condition. With gilt. Backstamp: Losol Ware Pagoda Keeling & Co Ltd Burslem Made in England. There is a little wear to the gilt, just a very little wear under the cover and minor discolouration inside the pot. Overall excellent condition. With gilt. No backstamp. A little wear to the gilt otherwise excellent condition. With gilt. Delightful little pot and cover. Backstamp: Losol Ware Pagoda Keeling & Co Ltd Burslem Made in England. There is a little wear to the gilt and just a little under the cover otherwise excellent condition. Pretty little ring tidy from a dressing table set. Made by Keeling & Co in their Losol Ware. The pattern name is unidentified, but it is pattern nmuber 4381. No backstamp. With gilt. A beautiful part set of a tray, small pin tray and two covered pots., lavishly decorated with gilt. Backstamp: Wilton Losol Ware Keeling & Co Ltd Burslem England and in script 3916. The tray has light crazing otherwise excellent condition. James Kent. Blue printed under the glaze with hand applied enamel colour. A pretty little oval pot with cover. Backstamp: James Kent Staffordshire Made in England. Excellent condition.